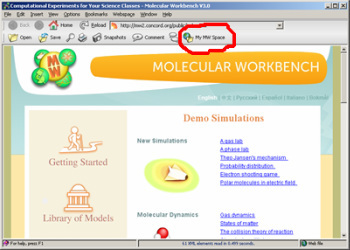 Molecular Workbench (MW) is an online simulation tool that helps you learn about how things work at the molecular level, that is, what are the atoms doing? It takes a little effort to get started but it's well worth it. Just follow the instructions below. 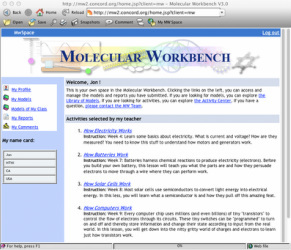 We will be using the Molecular Workbench (referred to as "MW") several times this semester to learn how energy (in particular, electrical energy) works at the atomic level. MW will lead you through a series of lessons prompting you for feedback as you go to make sure you understand. MW collects your feedback for review by Dr. Don. You will have class time to do the MW lessons but if you are absent or don't finish during class, you can do the lessons at home. Because MW uses a custom browser to communicate with its servers, it doesn't mesh very well with the school's firewall. You will have to do some manual adjustments to get it to work at school. These steps will probably not be necessary if and when you run it from home. Dr. Don has created an account on the MW server for each student in his class. You should have received an email to your HTH email account with the details. If you have not received an email from mw@concord.org, see Dr. Don immediately. You will be working in groups of two. As you work through an exercise, you will be given an opportunity to inform the system who else besides the person logged in participated. Be sure that both students get credit. Also, be sure both students read, understand, and share in writing the answers. It won't do you any good in the quiz if you have let the other person do all the work. When running MW from school, you need to set the proxy server by hand in the MW program. This may need to be done every time you log in to a new computer. 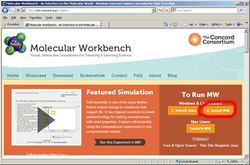 Go to the Preferences (under the "Options" menu of the MW window on a PC, or the "Molecular Workbench" menu on a Mac) and select the "Connection" tab. Select the "Use HTTP proxy server" option and type in "hthpl-proxy-01.ntc.hightechhigh.org" as the address. Note that this is a different address than the graphic at the left. Use your standard High Tech High username and password under "Proxy authentication" and click OK.
Now, close the MW program and restart it. The proxy is only invoked when the program starts up so you have to restart it whenever you change the settings. If you don't get this screen, look for the "My MW Space" button on the navigation bar to access the login page. The school's firewall may prevent this application from doing some things like registering a new user or changing your profile settings (like your password). You may have to do this from home or have Dr. Don do it for you at school. Once you have an account, you will be able to use your account at school. If you need to create an account from home, the following instructions work for both Mac and Windows except where noted. Most of the screen shots were sampled from Windows. Install the MW software. If you're not sure about whether you have Java, install it first. If you know your java is up to date and you are running Windows, click on the "2. Install MW" button (circled in red). Mac users click on the "Launch MW" button under "Mac Users". A file will download and should start installing. Depending on your browser, you may have to find the downloaded file and run it. After installing the MW browser, it should come up with this screen. To get to the login screen, click on the "My MW Space" button (circled in red). You should already have an account on the system and are now ready to log in with your ID and password given to you by Dr. Don.